7 Essential Oils that Make you Go MMH! I treat myself to a massage twice a year, at the beginning and the end of summer. I found a woman who gives an hour long massage for 40 dollars, and thanks to her, I become one with the universe and achieve a state of relaxation that only years of meditation can provide. She uses a holistic approach and always asks me which massage oil I would like her to use. Last time, she had me choose among argan oil, almond oil, and almond oil with cinnamon. I chose almond oil for my sensitive skin, but I must admit the addition of cinnamon intrigued me. I had previously only used argan oil for my hair, sometimes using it for my body. Argan oil is definitely one of the most famous vegetable oils. Rich in essential fatty acids, omega 6 and Vitamin E, argan oil is ideal for fighting dry skin. It softens the epidermis and is excellent for preventing skin aging due to climatic conditions. You can use it for hands, skin and hair, but it is also great for strengthening nails. Rich in vitamins A, D, E, avocado oil is known for its moisturizing, fortifying and regenerating properties and is particularly indicated for tired and dry skin. You can also use it on your eye and lip contour or to moisturize dry hair. Nourishing, restructuring, moisturizing, soothing and emollient, macadamia oil is indicated for treating stretch marks and acne scars. It is also excellent for hair. Its fluid consistency enables it to be immediately absorbed, and it does not leave a greasy feeling. Rich in vitamins A and E, this oil has nourishing, strengthening, emollient and toning properties. Important: beware of the risk of allergies if you are intolerant to almonds. It also nourishes and strengthens dry hair. Nourishing and hydrating, jojoba oil prevents aging and is excellent for healing superficial wounds (small abrasions caused by shaving or depilation, burns, insect bites). It nourishes dry hair, but is also indicated in the case of oily hair, because it helps to fight the excess sebum of the scalp. Highly nutritious, calendula oil is an excellent anti-inflammatory able to reconstruct the epidermis of inflamed, irritated, sensitive skin. Inhaling the aroma of cinnamon essential oil favors creativity and inspiration. It warms the heart and gives an enveloping feeling of “home.” This aromatic sensation helps in cases of inner coldness, depression, loneliness and fear. Like other essential oils, it offers a powerful broad-spectrum antibacterial action. When used as a massage oil together with almond oil, it promotes the elimination and absorption of intestinal gas and helps the digestive process. 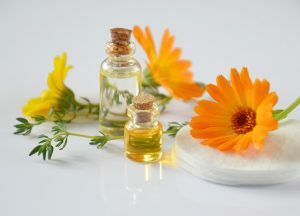 Essential oils and medicinal plants are just a small part of the long list of remedies that nature makes available to treat the body and the mind. Natural remedies may be used pure or diluted to take care of your body and your psycho-physical well being. Using vegetable oils allows you to avoid potential side effects of other products and respect the biological rhythms of your body. Honey, I Love You All Over My Body!